Last time when we were doing our best impression of "yum cha" at Ruby Chinese in PoCo, I noticed a Pho joint around the corner. Oh, if you are wondering why it was an impression of Dim Sum, just read the post. The food surely didn't resemble what good Dim Sum should be like. 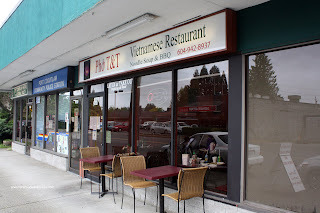 Anyways, Pho T & T caught my attention and wondered how it was. Hey, PoCo is not the hotbed of Asian food you know! So when I needed to take my son out for lunch, it seemed like a good idea. He likes Pho and so do I. No need to worry if he was gonna eat the food or not. When we arrived at the place, I asked him if he remembered going to Ruby Chinese next door. He replied with a negative. Strange, he has a good memory... I guess the Dim Sum was so bad, he had blocked out that experience! 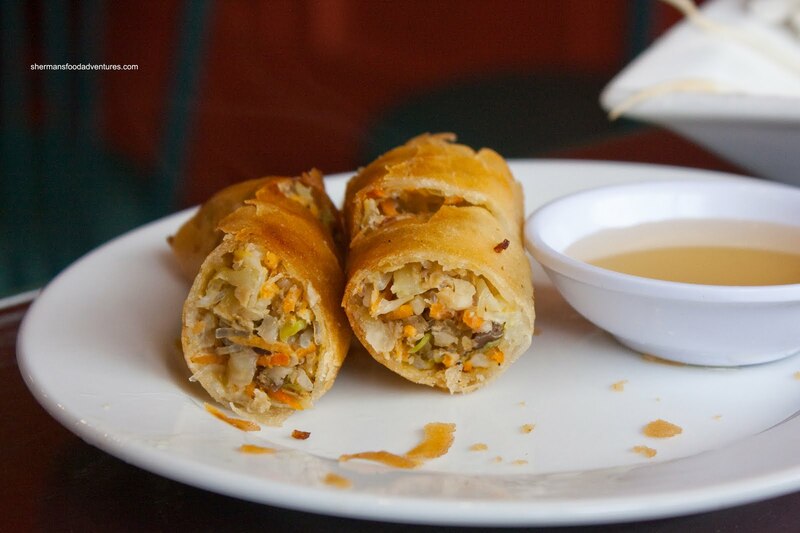 With any order of noodles, there is an option to add a Spring Roll for $1.00. I thought the filling was quite good with pronounced hints of fish sauce, onions and pepper. I as a bit disappointed that they did not use rice paper wrappers though. My son didn't mind since that's all he eats. He leaves the filling for me... So I ended up ordering a small Pho Dac Biet for him and not surprisingly he ate the noodles and soup. As for the meats, well that was for me and I wasn't complaining. The meats were tender. I found the broth itself to be more on the sweet side with a soy sauce aftertaste. Was the dark colour a by-product of that? 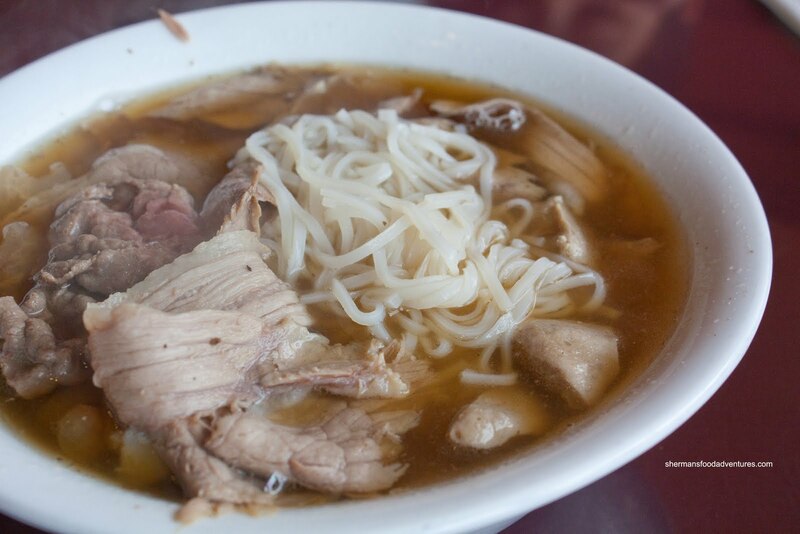 Whatever the case, the broth was above-average. 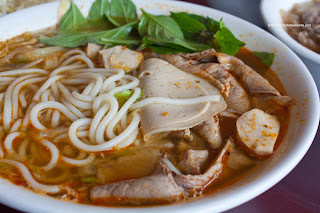 For myself, I had the Bun Bo Hue. It really wasn't all that spicy but it did have hints of lemongrass which made the broth aromatic. There was a good amount of meat though. I wished there was pork knuckle; but I guess we can't expect it everytime right? Now, at the entrance to the place, there is a placard boasting about great food, good prices and excellent service. Normally, that is an indication of a self-belief that really doesn't come to fruition. However, I must confirm the food was pretty good considering the location and the prices were really inexpensive. A large bowl of Pho is only $6.00! In terms of the service, it was very personable. I was even asked halfway through the meal if my food was okay! And that was with all tables in the restaurant.